Roof Pitch Calculator will instantly estimate your roof slope from every possible angle. You can calculate slope, area, rafters length and other dimensions. 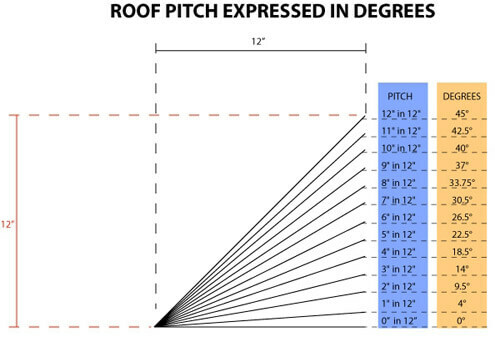 You can also convert roof pitch to Degrees (at the bottom). 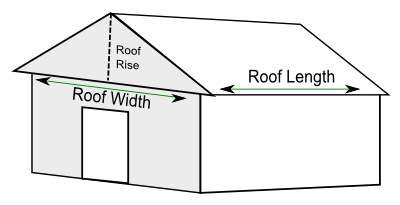 To estimate roof area, enter width and length (as shown in the measuring diagram below), and either Rise or Pitch – second value will auto-calculate. Click calculate. The results will pop up below the calculate button, and will include: Rafter Length, Total Size / Area, and Pitch. Using the diagram below, measure your roof from the ground, and enter building dimensions into the calculator #2 above. Enter the span (also known as gable side width), and the rise above the base line. To calculate your pitch and size, measure your roof and plug in your measurements in accordance with the diagram below. Enter EITHER Roof Rise or Roof Pitch. Enter pitch in the first box – calculation is automatic. If you do not know the rise, and do not have a ladder or cannot access your roof in order to measure it, you can accurately estimate the rise by measuring 3 spans of siding. Typical vinyl siding has 4″ exposure, so 3 spans would be equal to 12″ or 1 foot. Calculate the number of spans from the base line to the peak. Since most homes have a Rake wood, which is usually 6-8″ wide, you can add that width to the rise. [6″ + (19 * 4″)] / 3 = 6′ 10″ roof rise. To learn additional information about why roof pitch is important and different methods of calculating it, refer to our comprehensive Roof Pitch Guide. To get roof rafters length and accurate replacement cost, use our Rafter Calculator. If my building is 28 feet in width and I take 5 feet pitch, what rafter length do I need? You will (most likely) need a 16 feet rafter length, assuming you have overhangs that are LESS than 13″ (1 foot 1 inch) on each side. Both 16′ and 20′ rafters are available in regular pine 2x wood from lumber yards and Home Depot / Lowe’s etc. If you go over 20′, you will need LVL or engineered lumber, which is much more expensive. But in your case that is not necessary, because I don’t suppose you will have overhangs that over 5′. Hi I’m building a shed 24ft by 8ft and 7ft high, I’m using fiber cement roof slates but need my roof pitch has low has I can get it, can you please tell me how high I can go on the hight from sole plate to hight of roof, I hope this makes sense. I need to calculate a minimum 5 degree pitch over 3600 ml length. The height of the highest point is 2500 ml, and I want to calculate my post height. to horizontal 12°, better opt for the roofing brackets or boards. From what I know of angles and degrees 12/12 is 45 degrees. So 1/2 of that is 6/12 or 22.5 degrees. 1 pitch is 4 degrees. 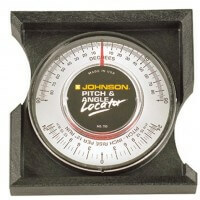 2 pitch is 9.5 degrees – that’s a 5.5 degrees step. 3 pitch is is 14 degrees – that is a 4.5 degrees step. However, those are not exact numbers – it’s more like 14.04 degrees for a 3 pitch. These roof pitches are treated as right triangle, and by applying the theory, the inverse tangent of 6/12 is actually 26.565 degree. if 12/12 is 45°, why is not 6/12 = 22.5°? The NaN issue happens when a user enters ” after the number in the input text box. These types of characters should not be allowed as input. Hope that helps.